This is a handy and very tasty one-pot dish. 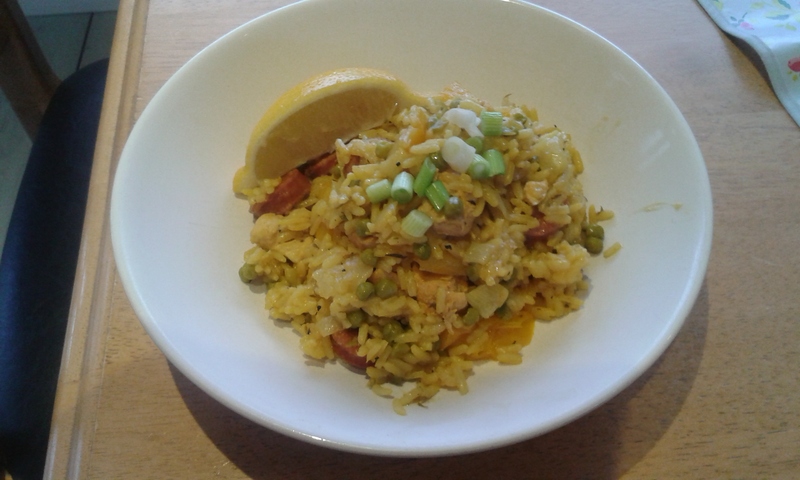 I call it paella because its rice based and has chorizo in it but, i make no claims that it is anyway an authentic Spanish paella especially as there isn’t a mussel or prawn in sight. Preheat the oven to 180 degrees Celsius or equivalent. Heat the oil in a heavy-bottomed pot or pan that is suitable for the oven. Dice and sauté the onion for couple of minutes and then add the garlic for a further minute. Add chopped chicken and sliced chorizo and cook for 2 minutes. Next add the thyme, bay leaves and turmeric and give it all a good stir. Add the rice and 3 cups of stock. Finally add the sliced peppers and peas. Bring it to the boil and then take it off the heat and cover the dish and transfer to the oven for 15-20 minutes. Check half way through cooking and add a little extra water if its dried- out or is sticking. The dish is ready once the rice is fully cooked. Garnish with chopped spring onion and a wedge of lemon to squeeze over the paella. This works equally well with tiger prawns instead of chicken and the leftovers are great to bring to work the next day. This looks gorgeous and so simple! Definitely will give it a try!